An African American gospel choir goes to Palestine to sing in a Palestinian play about Martin Luther King, Jr. They become witnesses to life under occupation and a non-violent movement for justice. An African American gospel choir is the Greek chorus for a Palestinian play on Martin Luther King Jr. which tours the West Bank preaching nonviolence. The choir is apprehensive about working with Palestinians whose American media image is that of angry, violent terrorists. For the Palestinian actors, Americans are unconditional supporters of their occupiers. It is a personal and cultural exchange where, over the course of the journey, their ideas about each other are radically transformed. Happy to finally visit the Holy Land, the choir witnesses life in the occupied territories, perform in a unique theater inside a refugee camp run by Juliano Mer-Khamis using art as an alternative to violence, and meet Fadi Quran, a young leader of a nonviolent movement for justice. 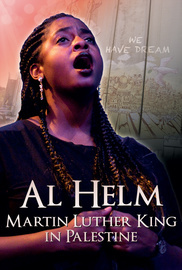 At the end of their tour reality will astonishingly mirror the play on MLK, a man who died for his beliefs.